Maja makes a girly hack for all kinds of knick knacks. 1. Buy one Lillholmen toothbrush holder. 2. Nag boyfriend for half a week until he remembers to borrow a drill from work. 3. Drill tiny holes in said Lillholmen. And there you have it. 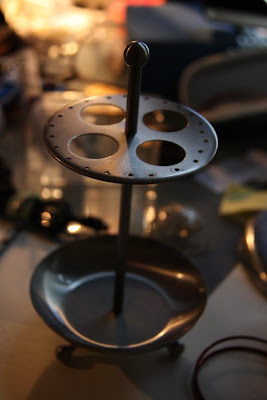 An earring/ring stand! See more of Maja’s earring stand. Can not wait to buy one and try it myself. I just did this myself and it turned out great! Thanks so much for the idea! There is one HUGE step missing: Remove the disk before drilling the holes. The top screws off and will make for much easier drilling. goodness… you are positively a genius. So cute. I have lots of stud earrings and the bottom compartment would be perfect for that. What size drill bit did you use? Calm down, drama llamas. I wrote the text for my own personal blog, not for ikea hacker. “Nag boyfriend” refers to the fact that my boyfriend works in a shop that sells – drumroll – power tools. I´d rather borrow one from them than spend my student loan on one. I did drill the holes myself, thank you very much. I don´t need anyone to “teach” me. Believe it or not, I can work a drill. You rant about sexism? You just judged a person and made derogatory remarks based on a single sentence. Way to demonstrate open-mindedness. 2. Get new boyfriend with testosterone who has own drill. 2a. Grab drill mentioned above. This is so sexist! Equality? I agree with Prue, grab the drill yourself, or at least ask somebody who knows how to use a drill to teach you, and then YOU can do it yourself next time. Aint that hard! And if you are a guy with lots of nice jewelry, do the very same thing! Otherwise, this hack looks good! 2. Grab drill you own yourself. You could also stack your rings on the top part of the stand, above where you hang your earrings.